This major new Handbook synthesises more than two decades of scholarly research, and provides a comprehensive overview of the field of terrorism studies. The content of the Handbook is based on the responses to a questionnaire by nearly 100 experts from more than 20 countries as well as the specific expertise and experience of the volume editor and the various contributors. Together, they guide the reader through the voluminous literature on terrorism, and propose a new consensus definition of terrorism, based on an extensive review of existing conceptualisations. The work also features a large collection of typologies and surveys a wide range of theories of terrorism. Additional chapters survey terrorist databases and provide a guide to available resources on terrorism in libraries and on the Internet. It also includes the most comprehensive World Directory of Extremist, Terrorist and other Organizations associated with Guerrilla Warfare, Political Violence, Protest and Organized- and Cyber-Crime. 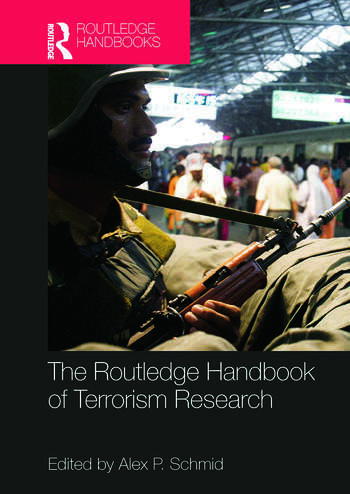 The Routledge Handbook of Terrorism Research will be an essential work of reference for students and researchers of terrorism and political violence, security studies, criminology, political science and international relations, and of great interest to policymakers and professionals in the field of counter-terrorism. Alex P. Schmid is Director of the Terrorism Research Initiative (TRI), an international network of scholars who seek to enhance human security through collaborative research; he is also Editor of TRI's online journal Perspectives on Terrorism. Until 2009, he was Director of the Centre for the Study of Terrorism and Political Violence (CSTPV) at the University of St Andrews, UK, where he held a chair in International Relations and, until 2005, Officer-in-Charge of the Terrorism Prevention Branch at the UN Office on Drugs and Crime (UNODC) in Vienna. Currently he is Fellow-in-Residence at the Netherlands Institute for Advanced Study in the Humanities and Social Sciences (NIAS).